The air is warm, the sun is shining, and BBQ season is definitely upon us! Last week I shared my Apple Wood Smoked BBQ Pulled Pork, and NOTHING goes better with a nice BBQ pulled pork than a delicious Classic Coleslaw! I have to be honest with you, my husband and I have never been real fans of coleslaw. It seems to always be too wet, and the flavor can be a little bland, BUT this coleslaw recipe is a game changer and you are going to love it! I can't wait to show you how I made it! To get started, shred the carrots, red cabbage, and regular cabbage. This can be done with a knife OR a grater. Next, chop your fresh herbs and green onions. If you do not have fresh herbs, you can use dry. Just reduce the amount by half. seasoning salt, herbs, salt, and pepper. Now whisk it all together. Mix it all together with the rubber spatula, and taste for seasoning. You may need to add a little salt and pepper. but over night is best. extra freshness! 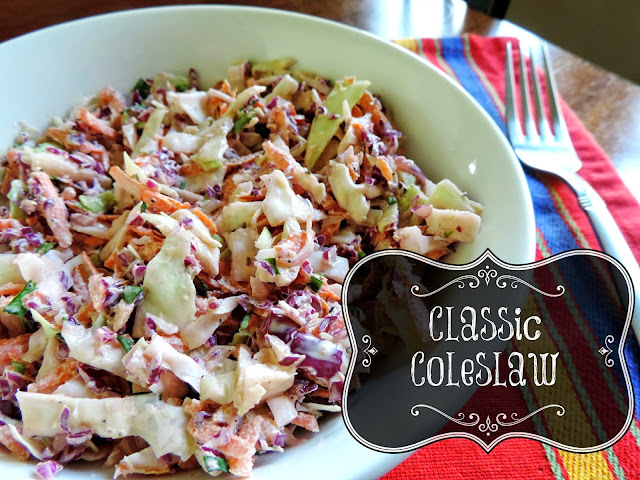 This Classic Cole Slaw is perfect on BBQ sandwiches or as a side at your next picnic! Get the kids in the kitchen with you and let them grate the cabbage! This is a side that the entire family can get in on! I know you are going to love it! Shred the red cabbage, cabbage, and carrots. Chop the green onions, parsley, and chives. In a mixing bowl, combine mayonnaise, sugar, vinegar, herbs, season salt, salt, and pepper. To the sauce, add the red cabbage, cabbage, and carrots. Mix together so that all of the vegetables are coated with the sauce. Taste for seasoning, and add any added salt and pepper the coleslaw may need. Cover with cling wrap and place in the refrigerator for at least one hour.